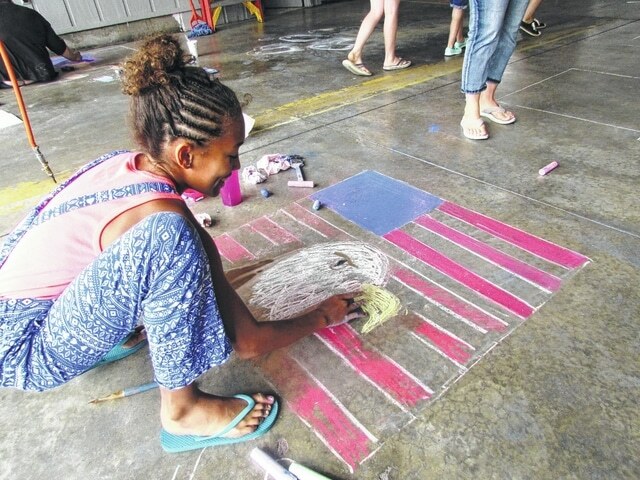 Cierra Lively of Hillsboro won first place Friday in the kids’ category in the KFC sidewalk chalk art competition during the Festival of the Bells in Hillsboro. She is shown working on her picture of an eagle against the backdrop of an American flag. Second place went to Maddison Garvie, and third place went to Callee Thompson. Proceeds from the event benefit SATH. The threat of inclemenet weather moved the event from the sidewalks to the bay of the Paint Creek Joint EMS/Fire District. Cierra Lively of Hillsboro won first place Friday in the kids’ category in the KFC sidewalk chalk art competition during the Festival of the Bells in Hillsboro. She is shown working on her picture of an eagle. Second place went to Maddison Garvie, and third place went to Callee Thompson. Proceeds from the event benefit SATH. The threat of inclemenet weather moved the event from the sidewalks to the bay of the Paint Creek Joint EMS/Fire District.